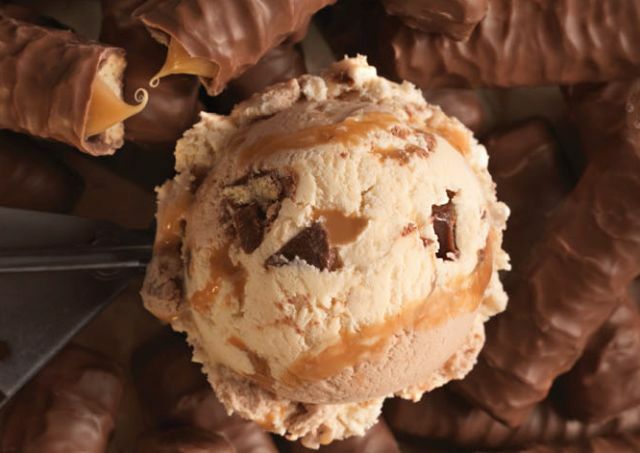 Baskin-Robbins launches new "Made from Twix" Bars ice cream as the June 2017 Flavor of the Month. The limited time flavor features chocolate-covered Twix cookie pieces, chocolate flakes, and a caramel ribbon in a combination of caramel and chocolate malt ice creams. The chain also adds to their warm cookie selection with the debut of the new Praline Pecan Cookie. Inspired by the chain's Pralines ‘n Cream flavor, the cookie aims to offer the same flavor but in a cookie. You can get it as part of an ice cream sandwich or as part of a Warm Cookie Sundae. For those looking to celebrate Father's Day, graduation, or some other special occasion around this time of year, the chain offers a number of appropriately-themed cakes (including The Cold One Cake, which looks like a frothy mug of beer).